On this day, Emily can joke about her little boy rather than worry. She doesn’t even dread the “terrible twos” that are just around the corner. Whatever happens from this point forward, she and her husband, Randy, can handle it because they know the worst is likely behind them. For much of his early life, Levi was in and out of hospitals; he was born with only 25 percent of his diaphragm, had surgery when he was a few weeks old to repair a diaphragmatic hernia — followed by five months in the NICU, and was hospitalized with a respiratory illness for the first time just 10 days after the NICU discharge. Levi had a tracheostomy tube placed at nine months. He did not tolerate the vent settings, leading to regular scares about his breathing and subsequent visits to the family’s local emergency room. “We were in an ambulance to the hospital every week,” Emily recalls. Levi coded for the first time in May 2017, and again in July of that year. “We found out he was working too hard to breathe and would tire himself out,” Emily says. She foresaw a childhood for Levi filled with frequent visits to the ER, an inability to breathe on his own, and constant fears that one of the trips to the hospital would be too late. “I just thought that he’d always have to do things the hard way,” she says. They transferred his care from his local hospital in west Michigan to Mott, where, in October 2017, Levi’s doctors determined he had tracheobronchomalacia, a rare disease that can cause the airway to collapse. Glenn Green (M.D. 1991), professor of otolaryngology–head and neck surgery, discovered that Levi’s trach was nearly hitting a main artery. He told the family that Levi could be a candidate for a 3D-printed tracheal splint that would hold open and prevent a collapse of the airway. The splint would also encourage Levi’s trachea to grow in the correct position before being resorbed by the body. The splint was still in the research phase, he told the Berens family, but he could request special permission from the FDA and U-M’s Institutional Review Board to use the device in Levi’s case. He was at risk for suddenly bleeding to death even if kept on a ventilator, Green says. With the splint, he was likely to be able to come off the ventilator entirely. And Levi would be a pioneer, as only the 12th patient to receive an airway splint. 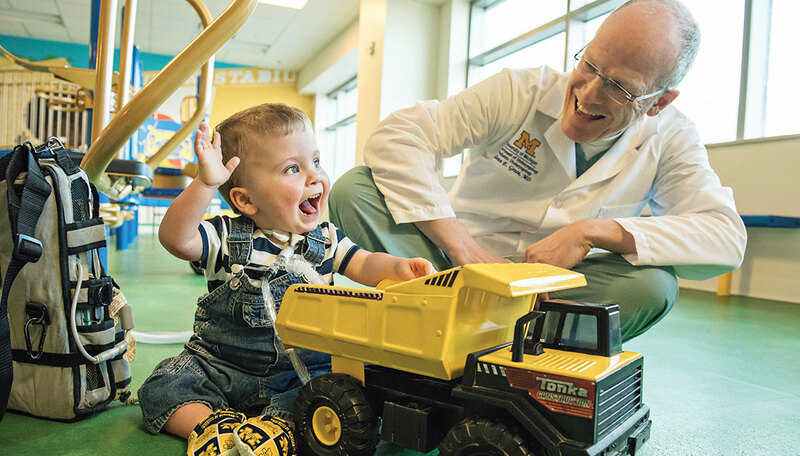 All of the now 19 surgeries have been performed at Michigan Medicine, where Green and former U-M biomedical engineering professor Scott Hollister, Ph.D., developed the 3D-printed bioresorbable airway scaffolding. The first splint implantation was performed in 2012, on Kaiba Gionfriddo, who received worldwide media attention, including a paper published in the New England Journal of Medicine. He is now a thriving 6-year-old. Back in the playroom at Mott in January, the nearly 2-year-old Levi plays with his 6-year-old sister, Sofia, and makes the sign language motion for “ball” when prompted by Emily. He won’t let the dump truck out of his sight, and he laughs and claps when a ball is rolled toward him. His rosy cheeks seem to dare you not to squeeze them. For something that has saved many lives, the airway splint is inconspicuous: Just one-quarter to three-quarters of an inch long, depending on whether it is used on the trachea or a mainstem bronchi, and based on the size of the patient. For something that has saved many lives, the airway splint is inconspicuous: just one-quarter to three-quarters of an inch long, depending on whether it is used on the trachea or a mainstem bronchi, and based on the size of the patient. The shape mimics a vacuum cleaner hose, and the biodegradable polymer material provides resistance against collapse while also allowing expansion as the child grows. Green and Hollister conceived of it after much frustration for the surgeon. “Severe tracheobronchomalacia has been a condition that has bothered me for years,” says Green. “I’ve seen children die from it. Too many. To see kids like Levi doing so well …,” he trails off, at a loss for words to fully encapsulate this man-made miracle. The device is created from a CT scan of the patient’s airway, integrating an image-based computer model with laser-based 3D printing. It is then sewn around the patient’s airways — by Richard G. Ohye, M.D. (Fellowship 1999), head of pediatric cardiovascular surgery at Mott, or Ming-Sing Si, M.D. (Residencies 2008 and 2009), assistant professor of pediatric cardiovascular surgery — to expand the trachea and bronchus and give it a skeleton to aid proper growth. The splint will be resorbed by the body in two to three years. The splint is an example of what the FDA has referred to as the “era of personalized medicine” made possible by 3D printing (or “additive manufacturing,” in industry parlance). A Market Data Forecast report from 2016 predicted rapid growth in the industry. In all, the report said, the global 3D-printing market for medical devices is estimated to catapult from $870 million in 2016 to $4.1 billion in 2022. A slew of other 3D-printed devices created at Michigan Medicine and Biomedical Engineering (a partnership between Michigan Medicine and the U-M College of Engineering) also fall into that category, including 3D tissue scaffolds for ear and nose tissue engineering. These offer the potential to improve anatomic function, reconstructive outcomes, and the social development of children who have deformations, says David A. Zopf, M.D. (Residency 2014), assistant professor of otolaryngology–head and neck surgery. Zopf created the ear and nose tissue scaffolds for craniofacial tissue engineering with Hollister. Tumor modeling “is another example of what a powerful tool 3D printing can be for enhanced patient care.” —David A. Zopf, M.D. “Ears and noses are notoriously difficult to reconstruct,” Zopf says. “Even van Gogh had difficulty with ears in his artwork.” Many of Zopf’s patients have microtia, in which the external ear is undeveloped, or have suffered a trauma. After rigorous training experiences, Zopf and colleague Jennifer Kim, M.D., associate professor of otolaryngology–head and neck surgery, are getting “tremendous outcomes” for challenging ear reconstruction in their Microtia/ Atresia Clinic, he says. Zopf believes, however, that the future is in tissue engineering. He and his team crafted the patient-specific porous ear and nose scaffolds with a biodegradable polymer that is resorbed by the body. Scaffolds are designed to be implanted with the body acting as a bioreactor, where cartilage grows around and through the scaffold’s holes until the ear is replaced with the patient’s own cartilage cells. This work is undergoing pre-clinical trials, with clinical trials anticipated within five years. The aim is that the scaffold will be resorbed and will leave healthy cartilage that looks exactly like a normal ear. Eventually, Zopf says, the scaffolds could transform ear reconstruction. Currently, the “gold standard” in the field involves carving a geometric shape from a patient’s rib cartilage. The problems with the procedure, Zopf says, are variable results, multiple surgeries, significant post-operative pain, chest wall deformity, and scarring. Additionally, few surgeons possess the artistry to create a convincing ear. While many Michigan Medicine departments are exploring 3D printing, the Department of Otolaryngology–Head and Neck Surgery has been particularly innovative. In addition to Green and Zopf, Sean Edwards (M.D. 2003, Residency 2005, Fellowship 2007), D.D.S., does the delicate work of fixing damaged faces. He worked with Hollister several years ago to develop computer modeling that incorporates patient CT scans and creates an exact replica of a patient’s skull. This process allows Edwards and his residents to digitally cut the fibula (calf bone) and determine the best way to resurface it and place it in the patient’s face. The ability to rehearse the surgery on the 3D replica shaves hours off of the patient’s surgery time (previously 15 to 18 hours) and increases the precision with which the notoriously tricky facial reconstruction takes shape. He has used the process in more than 400 surgeries so far. Edwards also is working with a pre-fabricated reconstructive flap that uses a biodegradable polymer scaffold rather than pieces of the fibula. It is seeded with a patient’s bone and tissue cells. The flap is then inserted into the patient’s back muscle to grow until it is ready to be implanted in the patient’s face, says Edwards, the James R. Hayward Endowed Clinical Professor of Oral and Maxillofacial Surgery, who has appointments at the School of Dentistry and the Medical School. The flap currently is in pre-clinical testing. “These scaffolding strategies will really allow us to personalize reconstruction, improve outcomes, and avoid the morbidity of a donor site. Everything we have learned in the past decade about how to use computer planning to idealize a reconstruction is applied to making these scaffolds with 3D printing. When this gets to the clinical realm, we will no longer be forced to make square pegs fit round holes,” Edwards says. Additionally, Green’s team has developed 3D-printed CPAP masks for children with craniofacial anomalies and accompanying sleep apnea. The anomalies often lead to a poor fit, but a 3D-printed mask — based on a mold made from 3D images of the child’s face — allows a tighter fit. Children in early trials experienced a significant decrease in leak rates, and Green predicts a personalized CPAP mask would improve usage rates as well. Zopf and Green have been mentoring and working with Allison Powell, a medical student at Michigan who has taken an NIH-funded research year to work in the 3D-printing lab (see story below), to develop a substitute for the rudimentary method used in nasopharyngeal airway procedures. Currently, the airway is inserted in the patient’s nostril, and safety pins are added to the flanged end of the airway to prevent the tube from going too far down into the throat. “I said, ‘we can do better than that,’” Powell recalls. Zopf and Powell developed a medical-grade silicone attachment mechanism to replace the safety pin, which has been in use with success since November 2017. Zopf has partnered with Albert Shih, Ph.D., professor of biomedical engineering and mechanical engineering, on this as well as several other projects. Another of Zopf’s passions is to see 3D printing used to generate high-fidelity surgical simulators. Green has extended his work with 3D printing to other areas as well. When one of his patients was 30 weeks pregnant, a walnut-sized lump was discovered on the fetus’s nose and mouth area. The lump could have prevented the newborn child from breathing. The mother’s surgeons at Mott had to decide whether they could deliver safely through a C-section or if a rare, complex procedure was needed. Using a specialized MRI of the fetus in the womb, they were able to print 3D models of the face, helping to determine exactly where and how dangerous the mass was. Green’s team learned from the 3D-printed models that the complex procedure that required partial delivery of the baby would not be necessary. Baby Conan was born via C-section. Another tumor-modeling success story was led by Zopf. A 15-year-old boy was taken to Mott for treatment of a rare — and large — tumor in his nose and sinuses that extended through his skull near his brain. “The tumor’s location and size had me question whether a minimally invasive approach would allow us to remove the tumor completely,” Zopf says. His team had a model of the skull created on a 3D printer, using polylactic acid. “It gave us a chance to dissect the tumor, in a way, ahead of time,” Zopf says. Zopf and Erin McKean (M.D. 2003, Residency 2008, Fellowship 2009), a skull base surgeon at U-M, were able to remove the tumor without resorting to a more invasive procedure. Tumor modeling “is another example of what a powerful tool 3D printing can be for enhanced patient care,” Zopf says, because it improves patients’ and families’ understanding of the procedure. Read more about 3D-printed devices, models, medications, and more involving Biomedical Engineering, Gastroenterology, Orthotics & Prosthetics, Radiology, and the College of Engineering. Not everyone is on board with the 3D-printing revolution — or, at least, certain aspects of it. “I think there’s a lot more roar to it than where the technology is,” says Steven Buchman, M.D., a professor of plastic surgery who specializes in craniofacial anomalies and facial reconstructions of children. “The problem that I have is really that, in most cases, it depends on whether you want to use manmade materials or biological materials to do reconstruction.” The tracheal splint, he says, is an example of 3D printing that he can get behind. It uses 3D-printed material, but only for a short time until the body can absorb it and do the work on its own. Michigan Medicine is the home of a new partnership with other institutions that is building a national framework to help more patients gain access to experimental drugs, devices, and biologics. The institutions will build a framework for a more efficient, consistent, and widespread use of the FDA’s Expanded Access process, which was used to gain approval for the tracheal splint procedures such as the one that Levi Berens had. The partnership is funded by the National Center for Advancing Translational Sciences. The Michigan Institute for Clinical and Health Research is coordinating the effort, called Transforming Expanded Access to Maximize Support and Study (TEAMSS). Green hopes that is the case. He understands the need for a full scope of tests and quality assurances, but he also knows that the tracheal splint in particular could be used to save many babies’ lives in the U.S. and around the world. “What we really need are resources” to move through the regulatory process, he says, noting that a clinical trial for the splint would cost about $4 million. A gift from Craig Sincock, president and CEO of Avfuel Corp., has been essential to the progress of moving the splint toward market, Green says, but much more outside support is needed. Otolaryngology isn’t the only department at Michigan Medicine working with 3D-printing technologies. Other areas, many in conjunction with Biomedical Engineering, are using the technologies to find solutions for patients. Some of those efforts are highlighted here. A few years ago, a Crohn’s disease patient teamed up with Peter Higgins, M.D., Ph.D., M.Sc. (Fellowship 2004), a gastroenterologist, to create a better ostomy bag. The patient, Brett Tripp, happened to be the founder of a biomedical design company, Tripp Design. The two have created prototypes based on 3D models made with digital scans of patients’ ostomy sites and stomas. Biomedical Engineering researchers at U-M, led by Albert Shih, Ph.D., have developed a system of designing and printing custom orthotics and prosthetics for amputees, stroke patients, and people with cerebral palsy. The technique provides a lighter, better-fitting assistive device with a quick turnaround time, says Jeff Wensman, director of orthotics and prosthetic services at Michigan Medicine’s Orthotics and Prosthetics Center, which is implementing the system. Shaun Kunisaki, M.D. (Fellowship 2010), an assistant professor of pediatric surgery, is working with Hollister (who is now at Georgia Tech) to develop new technology that will strengthen the surgical repair of the esophagus of infants born with a rare condition called esophageal atresia. The process uses a 3D-printed protective sleeve that is designed to reduce stricture rates and improve blood flow after surgery for the condition. The team is using resorbable biomaterials that have elastic properties that closely mimic an infant’s esophagus. Currently in pre-clinical testing, the technology also is being used as a novel platform for the eventual development of a “tissue-engineered esophagus” made from customized 3D-printed materials in combination with a patient’s own cells. A project led by Ariella Shikanov, Ph.D., assistant professor of biomedical engineering, involves a sacrificial scaffold, printed with a biocompatible sugar and biomimetic hydrogel mixture, that can support healthy development of an immature ovarian follicle in women and girls who have premature ovarian insufficiency. The scaffold is in pre-clinical testing. Some radiology faculty are making 3D-printed versions of CT and MRI scans and are “in the very early stages of trying to find some applications for this,” says William Weadock (M.D. 1992, Fellowship 1998), professor of radiology and medical director of ultrasound at the Von Voigtlander Women’s Hospital at U-M. Some of those applications could include simulations of biopsies and surgeries, and an ultimate benefit could be saving time during an operation — lessening the time a patient needs to be under anesthesia, Weadock says. Also at U-M, the College of Engineering has developed a technique for printing pure, ultra-precise doses of medications onto a wide variety of surfaces. Researchers there say the process could accelerate drug development and make life easier for patients who take multiple prescriptions every day. They predict that the printing of mass-market drugs is still years away but eventually could be done in clinics and pharmacies. And in an example of the far-reaching impacts of 3D printing in medicine, 10-year-old Casey Doyle’s medical team at Mott created something therapeutic for him. Its name was Boris. That was Casey’s name for the life-threatening tumor in his throat. In 2016, Casey took a 3D-printed model of Boris to his elementary school and smashed it to pieces before a cheering crowd of classmates. The moment was all the sweeter because Casey’s surgeons at Mott had already annihilated the real tumor. Allison Powell winds her way through U-M’s Biomedical Engineering 3D-printing lab and points out some of the projects she and Michigan Medicine faculty members are working on: a shelf labeled “tracheas,” two rows of magnetic ear splints, models of children’s tumors. “Here’s my drawer of ear hematomas,” she says. Powell is well-versed in all the medical devices being made in this part of the lab because she received a T32 NIH research grant through the Advanced Research Training in Otolaryngology Program (for the 2017–2018 academic year) to spend a year on research away from her studies at the U-M Medical School to work on this research. With two degrees in biomedical engineering under her belt, as well as a summer doing device design with Zopf and Green, Powell eagerly opted to take on the lab’s day-to-day operations. Many of the objects will be used in clinical care. Others are designed for research and education, such as the aforementioned ears, which give residents a chance to practice removing hematomas. She points out the numerous material types used to make the devices and models: silicone, sandstone, autoclavable resins. A few weeks prior to this visit, she saw her first cochlear implant surgery and was struck by the significance of the work she is doing. “Realizing the biomedical design work I can do can have such a big impact really motivates me to do this work,” she says. Powell points out a grouping of multi-toned cleft lip models. The rubbery fabrications provide opportunities for practicing cleft-lip surgery, and not just at Michigan Medicine. Zopf will take some on a surgical mission in Peru, for instance, to help local surgeons develop the skills to perform the operations themselves. Also on the global front, Michigan Medicine has a 3D printer at a hospital in Nepal. Plans for devices and models can be developed at Michigan Medicine, then printed in Nepal, or vice versa. Powell also took a rib simulator and facial flap simulator to Vietnam for two weeks. They are being implemented in surgical missions globally, such as in educational initiatives in Peru and Vietnam, to help local surgeons develop their skills. Beata Mostafavi, Amy Lenz, and Medicine at Michigan archives contributed to this story. *Full statement from Materialise: The bioresorbable airway splint was originally developed at the University of Michigan by pediatric otolaryngologist Dr. Glenn Green and biomedical engineer Dr. Scott Hollister. The technology was then licensed to Materialise, a company specializing in 3D printing, who will bring the airway splint to medical practice. So far, 16 children have received the bioresorbable airway splints under the FDA Expanded Access program, which allows patients access to life-saving medical devices that have not yet been approved by the FDA. In order to eventually obtain FDA approval, the University of Michigan and Materialise are working to begin a clinical trial to demonstrate the safety and efficacy of the airway splint as soon as possible. Children will be recruited from across the USA. Top photo: Levi Berens’ joy lights up a playroom at Mott as he plays with Glenn Green, M.D., the surgeon who brought hope and health to the toddler. Photo by Leisa Thompson Photography.